Long time readers of several past reviews and, especially, regular readers of the Tooning In column on this site, will have picked up on the fact that Robert Zemeckis used to be my favorite director, but that his recent attempts to squeeze anything near resembling a human performance from his computer generated puppets in such films as The Polar Express and Beowulf have left me stone cold and lamenting this once great filmmaker’s descent into the Dark Side. Where was the innovative and visually ingenious director of the Back To The Future trilogy, the man that forced animation to find its perspective for Who Framed Roger Rabbit, or who pioneered computer-assisted effects in such varied fare as Death Becomes Her, Forrest Gump, Contact, Cast Away and What Lies Beneath? In recent years he has thrown away the rough shot conditions of live-action and confined himself to The Volume, a hideously conceited term for a motion-capture stage, where Zemeckis has now spent almost a decade trying to convince us that a mo-capped Tom Hanks or Angelina Jolie are better than the real thing. Well, they aren’t, and the films have failed creatively as a result. But still Zemeckis tries and it has to be said that when I heard he had secured the services of a certain Jim Carrey for his latest attempt, I did wonder if the actor might have what it took to break through falsities of the mo-cap method and finally bring life to the dead-eyed “uncanny valley” characters that populate these films. Well, Carrey does and, prepare to be shocked, Zemeckis is back. Kind of. Apart from an early November release date simple being too early to go and see a Christmas movie, my underlying disappointment with the motion-capture process (and let’s stop calling it performance capture – certainly the end credits of this very film do away with that overcomplicated term and settle for plain old mo-cap) was the reason I, frankly, wasn’t jumping at the bit to catch Carrey and Zemeckis’ collaboration. When dealing with an actor of, say, Andy Serkis’ ability to render what the animators need in order to then pull out a true performance for characters like Gollum or Kong, the performer understands what he is performing for. With the likes of Anthony Hopkins or Ray Winstone in Beowulf, all they are giving is a pure stage performance, leaving the animators little to play with in terms of being able to broaden the caricature. It was ridiculous that the short and stocky Winstone was cast to play the tall and buff Beowulf, but he was so, just because it could be done. Carrey, who will remind British sitcom fans of Wilfrid Bramble’s turn as the old Steptoe in the legendary comedy Steptoe And Son (remade in the US, without Bramble, as Sanford And Son) actually gives what could quite possibly be his most convincing straight performance ever. His Ebenezer Scrooge is magnificent, old and crotchety but never keeping still and a constant parasitic presence. But as much as I was almost – and found myself wanting to be – drawn in, frustrating details kept appearing to me, even though I wasn’t looking for them and didn’t want to be distracted. Clothes, for instance, should not stretch on a human if they bend their arm as if they have been painted on them, which led to my constant and annoying picking up of every forearm on every character being too long, especially when they bent their arms. This is a basic, direct-to-video no-no, not something that should have been missed in a much bigger budget production under an undoubtedly much more talented crew. Much of the text is taken from Dickens’ original, which sometimes works and sometimes doesn’t. There’s an emotionally pivotal scene, where young Scrooge is dumped by his finance, played by Robin Wright Penn, but the sudden lapse into aged prose means that the language won’t register to everyone. Of course, actions speak louder than words, but since she is unable to make authentic eye contact because of the feeble mo-cap work, there’s a lack of true emotion, and one or two “did she leave him?” questions from younger audiences. The scene with Scrooge’s sister Fanny is even more cringe-worthy, and I can’t say much better for Bob Hoskins as Fezziwig and, repeating the dual identities notion, Old Joe. You’d think that Hoskins would be the perfect Fezziwig but, begging the question of why these films are not just shot with live actors who are matted into backgrounds afterwards, is the sight of Fezziwig dancing – Hoskins’ mo-capped head bobbing about statically on top of an obviously key framed body is just strange. The Ghost Of Christmas Present is really good, and it’s another frustrating aspect of the movie that begs, why can’t the other characters be given the same amount of detail and all be this great? If it’s time and money that need to be spent on achieving the remarkable results Carrey and the animators accomplish with the Christmas Present character, then this is precisely where Zemeckis’ future motion-captured endeavors need to be focused. My fear is that his next such film, a pointless remake of Yellow Submarine, would try and ostensibly resurrect the band circa 1968, but if Image Movers Digital (apparently now a company free from its Sony Imageworks association, going by their Hewlett-Packard endorsement and IMD retaining the copyright on this film) can get close again to what they’ve captured with Christmas Present, it could offer some hope. A great deal of the genuine Christmas spirit throughout the film comes from long-time Zemeckis composer Alan Silvestri, who fills his score with traditional Christmas carols but never over emphasizes them, choosing instead to pick a phrase or two only and weave them into his original music. 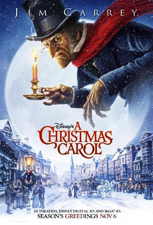 It has a wonderful effect of serving the film with much more magic than it might have, the mixture of deep orchestral arrangements and choirs bringing a real joy to Scrooge’s world and carrying him and the characters through their journey. A particular moment where all the elements come together grippingly is a nightmarish scene towards the end of the Christmas Present sequence, where the score and excellent lighting both go some way to really making the moment something you can’t peel your eyes away from, even if the video game camera moves and the two child sprites are to over the top. A Christmas Carol is certainly the best of Zemeckis’ three (and a half, if you count the executive produced Monster House) mo-capped tryouts so far, despite the many shortcomings still inherent in the method. They say “the eyes have it”, but that unfortunately that’s where mo-cap still falters and is the biggest hurdle for the process to jump. 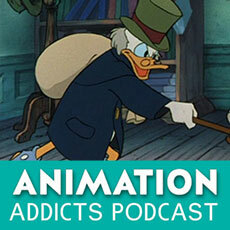 Every so often the older Scrooge looks too young, especially around the eyes, though I’ll be charitable and suggest this could be an intentional effort to express the good that remains inside him. But the Ghost Of Christmas Present somehow manages to fully overcome this difficulty – whatever it is they were doing differently I don’t know, but he just works, and they need to pursue this angle further if mo-cap is to remain a viable animation medium. All of which leads to my being 50/50 split over A Christmas Carol. Because, Ghost Of Christmas Present and Scrooge at certain times apart, the motion-capture on show here is just still too clunky to be taken as an authentic alternative (though I await with great interest the WETA result of Spielberg and Jackson’s mo-capped but stylised Tintin movies). Even the person I was viewing the film with, who hadn’t been aware it was a mo-cap film, asked why the characters looked “funny and plasticky” and thought it was down to bad make-up. However, on the flip side, we both did still enjoy the various elements, namely Carrey’s performance, Silvestri’s score and the good old, basic story; the film certainly has an entertainment value. But, then again, did we really need another version of Dickens’ tale?